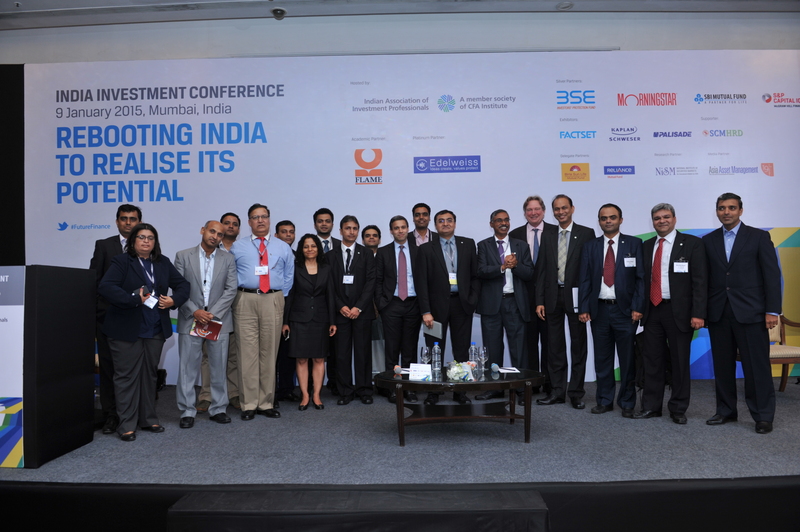 The fifth India Investment Conference (#IIC15) received overwhelming response in terms of participation by members and industry. What with distinguished speakers starting from (1) Professor Arvind Panagariya, Professor of Economics and Jagdish Bhagwati Professor of Indian Political Economy at Columbia University and the recent appointed Vice Chairman at Niti Aayog, a policy think tank of the present government under Chairmanship of Prime Minister of India Shri Narendra Modi, (2) Vikram Mansharamani, global equity investor, lecturer Yale University, and author Boombustology (3) Jason Voss, CFA, Content Director at CFA Institute and author of The Intuitive Investor and (4) Russell Napier, Independent Strategist and Co-Founder ERIC. Afternoon saw insightful executive panel discussion on “Financing Infrastructure to Reignite Growth” with experts like (a) Rajnish Kumar, Managing Director, SBI Capital Markets, (b) Parthasarathi Mukherjee, Group Executive Corporate Relationships & International Business, Axis Bank, (c) Rahul Mody, Managing Director, Ambit Corporate Finance, and (d) Apurva Shah, Managing Director, Investment Banking, Deutsche Bank Group. All of these sessions were moderated by experts in the investment fields (in same order as the sessions) viz. (i) Navneet Munot, CFA, CIO SBI Mutual Fund and Director IAIP, (ii) Vikas Khemani, President & CEO, Edelweiss Securities (iii) Ashvin Vibhakar, CFA, Senior Advisor & Executive Sponsor Future of Finance, CFA Institute, (iv) Sunil Singhania, CFA, CIO Equities, Reliance Mutual Fund and Member Board of Governors at CFA Institute and (v) Saurabh Mukherjea, CFA, CEO Institutional Equities, Ambit Capital. Anil Ghelani, CFA, Senior Vice President, DSP Blackrock and Director IAIP and Saurav Mishra, Head, Local Corporate Treasury Sales, Deutsche Bank India and Director IAIP were the Co-Chair Conference. Paul Smith, CFA, Managing Director APAC & Global Head Institutional Partnership at CFA Institute and Jayesh Gandhi, CFA, Senior Portfolio Manager at Birla Sun Life AMC and President IAIP made the opening remarks (reproduced below) and Vidhu Shekhar, CFA, Country Head India, CFA Institute closed the conference with vote of thanks. IAIP is thankful to its supporters and sponsors viz. (1) FLAME as Academic Partner, (2) Edelweiss Financial Services as Platinum Partner, (3) BSE, Morningstar, S&P Capital IQ, SBI Funds Management as Silver Partners, (4) FactSet, Kaplan Schweser, Palisade as Exhibitors, (5) SCMHRD as Supporter, (6) Ambit, Birla Sun Life, DSP Blackrock, Reliance Mutual Fund, SBI Mutual Fund as Corporate Delegate Partners and (7) NiSM as Research Partner. According to Paul Smith, CFA, Charter is not just educational. It is dedicated to connecting investment industry with the society, a social contract with the society, which produces protective barrier & provides its stamp of approval, acknowledging professional excellence. Professionals intermediate capital that benefits all members of the society. CFA Institute engages with employers, industry, regulators, and provides global and local views. 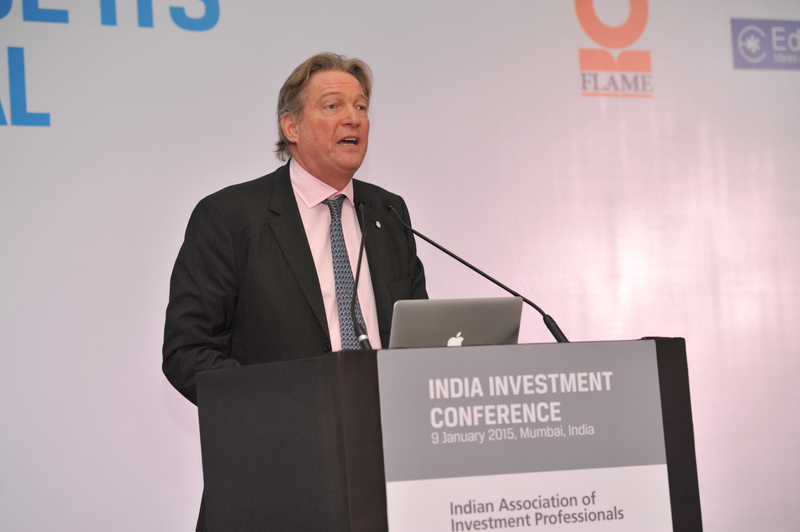 The wave of optimism running in India coincides with opening of CFA Institute’s subsidiary in India. The campaign of “Putting Investor First” is planned in the month of May. CFA Charter Holders should come forward to contribute and volunteer for the society. 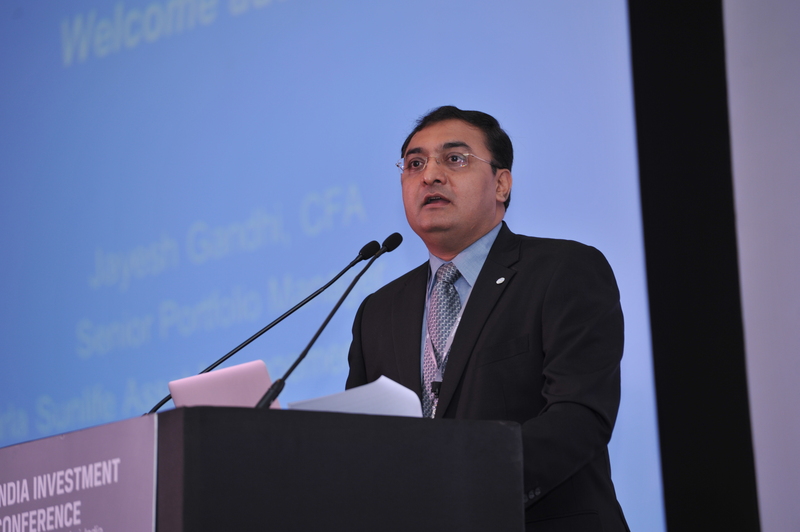 Last year’s “hope” has transformed into “confidence” now according to Jayesh Gandhi,CFA. IAIP’s Annual Forecast Survey in April 2014 had correctly predicted Shri Narendra Modi as next Prime Minister of India. There is a sense of optimism and belief in the country. Domestic investors are coming back to equity markets. IIC15 tries to address issues facing investors like sharp fall in crude oil, turmoil & tensions in various parts of the globe and so on. He refreshed participants that IAIP is a volunteer run organization with emphasis on knowledge, ethics and professional standards. Currently, there are 1,200 members in the country and 5,000 mark is not too far. It has active Advocacy group, which engages with local regulators & has come out with AGM guide, Investment Research Challenge, wherein more than 40 business schools participates, and other active groups. This entry was posted in Events, India Investment Conference, Mumbai and tagged #FutureFinance, #IIC15, @iaipcfa, Ambit, Anil Ghelani CFA, Apurva Shah, Arvind Panagariya, Ashvin Vibhakar CFA, Birla Sun Life, Boombustology, BSE, CFA Institute, Chetan Shah CFA, Columbia University, DSP Blackrock, Edelweiss Financial Services, ERIC, Factset, FLAME, IAIP, India Investment Conference, Indian Association of Investment Professionals, Jagdish Bhagwati, Jason Voss CFA, Jayesh Gandhi CFA, Kaplan Schweser, Morningstar, Navneet Munot CFA, NISM, Palisade, Parthasarathi Mukherjee, Paul Smith CFA, Rahul Mody, Rajnish Kumar, Reliance Mutual Fund, Russell Napier, S&P Capital IQ, Saurabh Mukherjea CFA, Saurav Mishra CFA, SBI Funds Management, SCMHRD, Shri Narendra Modi, Sunil Singhania, The Intuitive Investor, Vidhu Shekhar CFA, Vikram Mansharamani. Bookmark the permalink.